Softening is an exquisite film by Kelly O'Brien, documenting life with her son Teddy, now 6, who was born with brain damage and a grim prognosis. It's a candid story about a mother's love and loss, a sister's magical bond, a father's joy and dedication and a little boy's experience of the world, moment by moment. It premiered at Toronto's Hot Docs film festival in April. Teddy and sister Emma appear above. Here Megan Jones interviews the filmmaker Kelly O'Brien. BLOOM: When did you decide to make the film? Kelly O'Brien: Before I had kids I was a television producer and I made diary films on the side as a hobby. And then when Teddy was born I had to stop working. But I had an old video camera kicking around. And so I took little movies of what was happening but I never really thought they would become anything. I knew when Teddy was born that it was the stuff of drama. I knew that if I could tell the story it would be something that people were interested in. But I was in too much pain to be able to figure out how to do that. I guess when Teddy was three, I applied to school and I went back and did my master’s in fine art at York. And that’s how I really made the film. I needed people to tell me that it was important to make the film because it was a really hard film to make. And I don’t think I could have made it outside of that. I always wanted to shed a different light on disability from a very personal perspective. But I needed other people’s help to get to that place, and feel like it was something I was able to do. And I also needed to have enough distance from the initial few years after Teddy was born to be able to have the space to make it. BLOOM: What was the main catalyst for making the film? Kelly O'Brien: I read Joan Didion’s book The Year of Magical Thinking. She wrote about the death of her husband, and she said that she wrote that memoir as a way of trying to make sense of what happened. And I guess when I heard that I thought that I could use this film as a way of making sense of what happened to me, to Teddy, to our family. 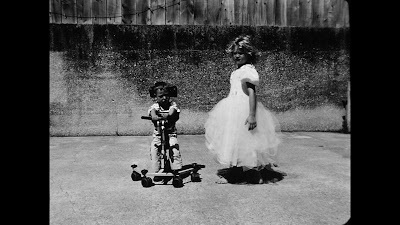 BLOOM: In the film you say that you couldn't look at pictures you'd taken of Teddy. How did you move from that to making an entire film? Kelly O'Brien: It was a really slow process. You can kind of slowly remember what happened. And then you look at images one by one and year by year and they kind of come back to you. I think there are a lot of factors, I think time was one of them. I had dealt with that initial sadness of ‘This isn’t the child that I thought I was gonna have.’ To coming to a better place with it all. I think that made it easier to look at the pictures. But it wasn’t really until watching the images—there’s a scene where Teddy’s sitting in his high chair, and he’s playing with a toy, and at the end I say ‘Oh, he looks so happy!’ I didn’t remember that footage. When I saw it a few years after I had taken it, I was taken that I had that perspective back then, that I was able to see that happiness in those moments. But it’s a slow process. I still don’t really want to watch the film. It’s not easy to watch at times. Also, I say in the film, a lot of it just had to do with getting to know Teddy better, and appreciating him for who he was. BLOOM: Did making the film change your relationship to Teddy? I think it allowed our family to make something together. I miss that, that connection. We would spend time together and it felt like we were doing something creative and fun as a family. And it was a special time that Teddy and I did have where it felt like I wasn’t just being sad, or taking care of him. We could do this thing together. So yeah, there was a bond, a closeness that we have that we discovered in the making of it. 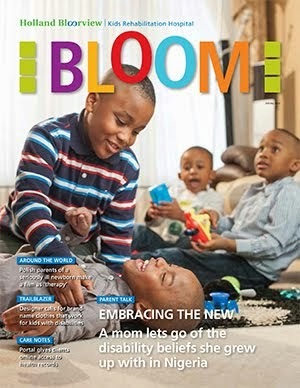 BLOOM: Has your thinking about disability or about parenting changed? Kelly O'Brien: I think the film maps a journey. I think I would have come to it anyways. But I think it’s complicated. There’re so many different emotions that you have around having a son like Teddy. And they range from grief to joy. One of the important things for me with the film is that I’m not really one of those parents of a kid with special needs that thinks it’s a gift from God or a blessing in disguise. I don’t believe that. I think you have to make it joyful. I don’t think it’s like fate or something like that. I wanted that to be in the film. I wanted to be honest. And I also wanted to show that honesty with Emma. I also wanted to talk about what it’s like to be a sibling of a child with special needs. BLOOM: Why was it important for you to make the film for yourself rather than hand your story off to someone else? Kelly O'Brien: I didn’t leave my house for two years after Teddy was born. I was devastated. I didn’t do anything. So initially it was a way for me to get back into the world and have some connection to what I used to do. Now I feel more like I’m on a political mission, to tell you the truth. If I can make a child like Teddy more human to people and so they see the complexity of our situation, but also the beauty of it, then I feel like that will be worthwhile. BLOOM: In light of that, is there anything in particular you’re hoping audiences will take away from the film? Kelly O'Brien: I hope that it makes people think differently about family and about different ways of connecting. That you can find love and compassion for—it sounds so cliché—but for people that are different than you. BLOOM: The documentary is so personal. Were you ever afraid of what people would think or say about the film? Kelly O'Brien: Jeanette Winterson wrote a biography called Why be Happy When You Can Be Normal? And she talks about writing the story that she could live with. The real story was too painful. I think I did that. This isn’t the whole story of what we went through. They’re just fragments of our life. Some insight of what it’s like to have a kid like Teddy. I think I worry that I maybe presented a prettier picture. I was always afraid that I couldn’t say what I wanted to say. I feel like I’ve been through so much though that I honestly don’t care if people don’t like it, or don’t agree with what I have to say. I just wanted to be as honest as I could to what I was experiencing and what our family was experiencing. BLOOM: What were the things that got left out? Kelly O'Brien: A lot of my sadness wasn’t in the film. There were two years of intense sadness. I felt like that wasn’t fair to Teddy. I didn’t want to portray what happened as a tragedy. That wouldn’t have been an interesting film. Who wants to hear about a mother complaining and whining? I knew that I had to get to a better place before I made the film. I also knew that Emma and Terence had very different relationships with Teddy. And all of a sudden that donned on me, that that would be really important. Initially this film was just going to be about me and Teddy and then I thought that would be too narrow. The other thing that got left out was all of Teddy’s doctors' appointments. I couldn’t film that, it was hard enough for me just to be at those appointments. I couldn’t do it. So I chose just to film Teddy at home, and then it became clear that it would just be this really small, intimate film about Teddy and our family. When I was pregnant with Willow, I was just beside myself with worry over that pregnancy, and I was trying to edit the film. And I would listen to some of the messages friends had left after Teddy was born and I just couldn’t do it. I put the film on hold until she was born, and then was able to work on it again when that worry had subsided. BLOOM: What were the biggest challenges of the filmmaking process? Kelly O'Brien: There were so many challenges. I can’t even tell you. Just having to take the pictures, to figure out what you want to say about them, to get to a place where you’re actually emotionally stable enough to do it. There were moments when I was editing it together that I was just sobbing. So I think I just needed to get to a place where I was okay, and I could tell the story in a way that was fair to Teddy. Because he can’t speak for himself. I think that was a big challenge. How do I talk about him when he can’t talk about himself? And how do I do that in a way that’s ethically fair? How do I represent him honestly? And then how do I talk about the difficulties of that in a way that still maintains that fairness? Just coming to terms with my own grief and getting to a place where I could think about those bigger questions was a challenge. The joy was when I could actually look at some of those pictures of Teddy and see the beauty in them. There was a lot of beauty there. And then seeing footage of Teddy with my youngest daughter when she was born—how sweet that was—and being able to celebrate that. I’m glad I have those images, as opposed to before when I couldn’t look at them. Being able to have that memory bank is important. The beauty of it was really important to me. Even now, you take Teddy into the world and people gawk and stare and I can’t bear it. You just relive what happened, the story, over and over again when people stare at you like that. I felt like if I could make it beautiful, then people wouldn’t turn their heads, or they wouldn’t have so much fear. They would be able to see the situation, see Teddy for who he is. The other challenge for making the movie was that when Teddy was born there was no great overcoming of obstacles. He actually ended up with a bit of a worse diagnosis than the one we were given when he was born. In documentary you’re supposed to have this huge transformation and a happy ending. And I knew that wasn’t the arc of our lives. I was conscious when I was telling our story that it wasn’t a sort of ‘TV movie of the week’ story about disability. BLOOM: Could you explain the significance of the title of the movie? I feel like that’s what happened to me. What happens initially when you’re dealing with grief is you become angry and bitter—you become quite hard. I was not a nice person to be around. But there’s also this incredible vulnerability, this rawness because you’re so emotionally opened up. And that’s a beautiful place to be in. You can’t live your life like that. But to be open and kind hearted and open and soft is worth it. And I think having Teddy in your life—he does that. Just reading this interview was cathartic for me. Thank you, as always, Louise, for finding people like Kelly and for sharing them with us. And thank you, Kelly, for sharing your thoughts and feelings with us -- many of whom, I'm certain, feel a real kinship with you already. I hope that I have the opportunity to see the film one day! Kelly, thank you for this beautiful and candid interview. I appreciate very much that you discuss the intense sadness, the complex feelings ranging from grief to joy, having to make our extraordinary circumstances a joyful one, and the sensitivy you show in nurturing the special sibling bond between your children. So much goodness in this interview! I, too, hope to view your film one day. This touched on so many of my feelings as a mother. I am holding back tears. Softening - I love that choice of words. I feel it, too. Hope I get to see this film! Ditto to everything said above! Thank you! This is so incredible! I just learned of Kelly's work, thanks to the recent NYT op-doc, and was thrilled to find this interview. As a sibling myself, I am always excited to find alternative portraits of disability in the family (i.e., beyond triumph/tragedy portrayals). It is so much more complicated and, in many ways, everyday. Please check out my blog disabilityfieldnotes.com for some of my writings on disability, families, sibs, and culture. thank you for your honesty -- it jumped out and grabbed me.